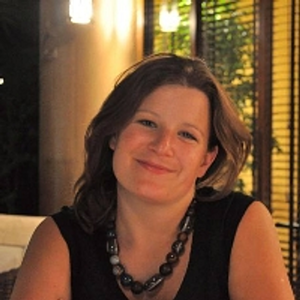 Our winner is the one....the only.....Charlotte Borthwick, Digital Communications Specialist at G4S! 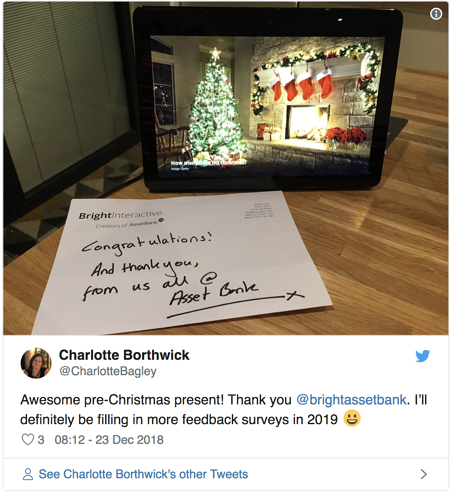 Like many of you, Charlotte completed our client feedback survey back in December 2018 and was entered into our prize draw to win an Amazon Echo Show bundle. Once we'd chosen our winner, we gave her a call to give her the good news and she was delighted - 'I've won one before in another competition and my son loved it so much I thought it'd be great to have one in another room in the house! I'm so pleased I've won, thank you so much!' That answered our question when we wondered if Charlotte had planned to give the prize away as a Christmas present - it was clearly too good to give away! We packaged Charlotte's gift that very day so that it'd arrive in time for Christmas and she sent us a great picture of it all set up and in situ. "I'll be using it I'm sure over the festive period. I'm going to be at home with family this year but with a short trip to Devon at some point to visit other relatives". Well, congratulations Charlotte, we're delighted it arrived on time and thanks for providing us with so much valuable feedback and insight. Thank you to everyone who filled in the survey & entered the draw. We've been busy gathering and analysing the feedback and will be sharing some of the insight with you all over the next couple of months. We'll be running more surveys throughout the year and so we'd love you to take part. There might be another prize in it for you too!